Overcharge: Gain a large amount of Critical Stars. in doing so, made England the ruler of the Age of Exploration. 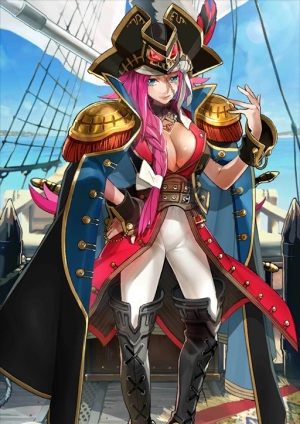 She was also the one who destroyed the "Invincible Fleet" of Spain, and brought down the so-called "Empire On Which the Sun Never Sets." This is why she is called "The Woman Who Brought Down the Sun." 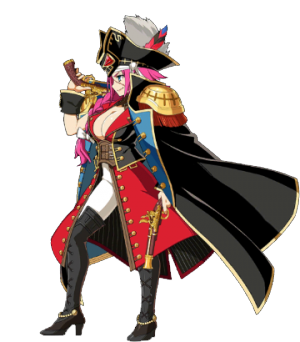 A lady pirate who's more manly than any man. Her personality makes her treat both good and evil equally. A hedonist who loves glitz and glitter. She prefers momentary pleasure, and both in war and her private life, prefers to act like a tempest that blows through anything and everything, until there's nothing left behind. She loves gold and treasure, but not the hoarding aspect of it, she loves to spend all of it. Night of the Golden Hind and the Storm. 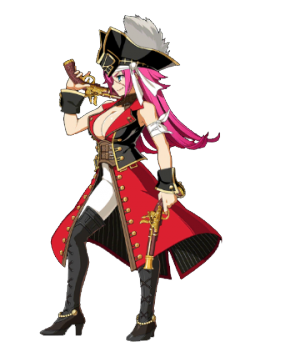 Summons a fleet of ghost ships with the flagship, the ship Drake was in command of, the "Golden Hind." Then the fleet will destroy all enemies with its overwhelming firepower. A special skill given to heroes who became a "turning point" in human history. Any and all difficult missions or difficult sails will remain "impossible" yet become "achievable." Francis Drake was the first person in history to successfully navigate the globe alive. 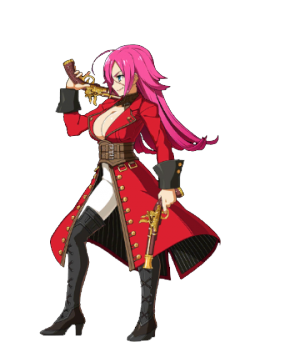 The historical Drake was male, but in this game she appears as a woman. The reason for this is that no one around Drake would treat her as a woman. "You know, if we call her a woman, then I don't know how we could be men... and it'll be rude to her, too." A hedonist who prefers momentary pleasure, and at the end, her last moment was dazzling. At the age of 53, she fell victim to illness. It's said that just before her death, she strangely tried to wear her armor in bed. An adventurer, a privateer, and commander of a fleet. Through the profits reaped from her circumnavigation of the world, England came to dominate the Age of Discovery. 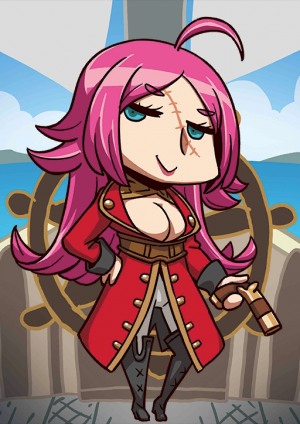 Furthermore, she sunk the powerful Spanish Invincible Armada, virtually crushing Spain - once called the Empire on which the Sun never set - and became known as "the woman who sunk the Sun". 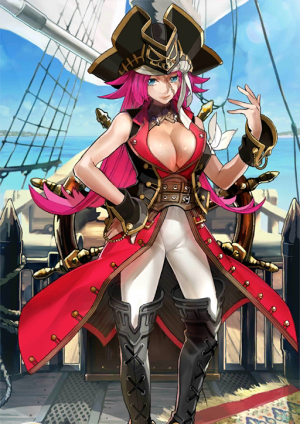 A female pirate manlier than men. 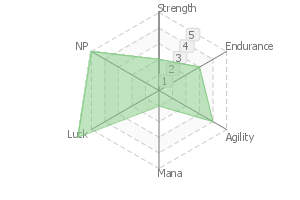 A personality that treats good people and evil-doers alike without distinction. A hedonist, and at any rate, she likes to be flashy. Though momentary pleasure is good, she also likes it when there is nothing left afterwards in both private life and in war, as if a storm has blown past. 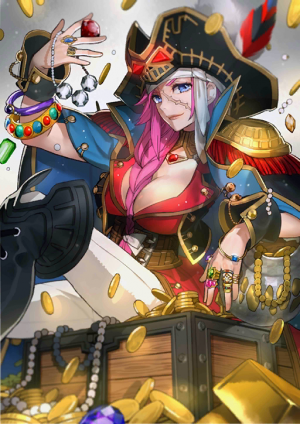 Though she likes treasure, she is not fond of hoarding, but instead loves to spend. "The Golden Hind and the Stormy Night"
With Drake's beloved ship, the "Golden Hind", at the center, the innumerable fleets she once commanded in life are summoned and deployed. A full volley with overwhelming firepower then devastates the enemy. A special skill given to those heroes that became a turning point in human history. All difficult voyages and troubles turn from "seemingly impossible" to "something that can be realized". Francis Drake was the first great figure in human history to survive a trip around the world. Although a man in historical fact, Drake appears as a woman in this work. That is because no one around Drake saw her as a woman. 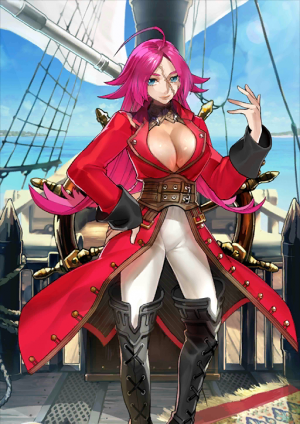 As her crew says, "Nah, if you look at the Capt as a woman, then can we even call ourselves men, or rather, wouldn't it just be plain rude to her?" As she was a hedonist that pursues momentary pleasure, what awaited at the end was a flamboyant fall. This Heroic Spirit has no attachments to life (existence, meaning as a human, pride), and instead approves of death (the downfall that visits all alike). At the age of 53, she succumbed to sickness. Right before death, it was said that she was so confused that she attempted to wear armor while on her sickbed. This page was last modified on 13 November 2018, at 17:14.